Arugula is a fast growing annual salad green that you either love or hate. It has a strong peppery mustard like flavor. Once used sparingly to add a bit of zing to a salad or stir-fry, it has become a star in its own right and is often found as the main ingredient in a salad. The young leaves are the tastiest but if the plants get too old to eat the leaves, try letting them flower and using the flowers. These are rather nutty tasting and make a delicious garnish mixed into salads, pastas or grilled vegetables. Add Arugula flowers to summer sandwiches of fresh tomatoes and grilled eggplant. 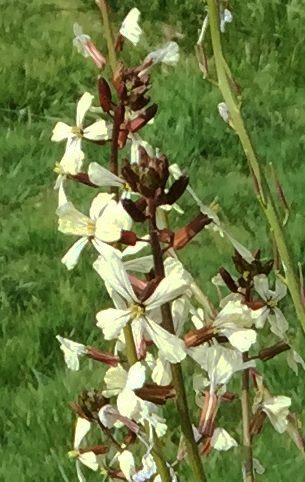 While Arugula flowers are tasty, if you let your Arugula go to seed it will come up everywhere! You might like this or you might not. It is not hard to pull out but there can be a lot of seedlings to pull. 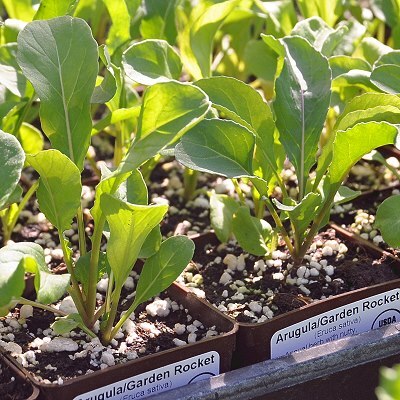 Arugula makes a great addition to our Edible Flower Herb Garden Six Pack. This plant is sometimes available in plug trays. These trays hold 128 of all the same plant. They are a great low cost way to fill a lot of space. Each cell is 3/4 of inch by an inch. Check here to see if Arugula Plug Trays are available.